How do you find out if you have HTLV? You find out if you carry HTLV by having your blood tested for HTLV 1 and 2 antibodies. First your blood will be tested using an ELISA test. This test screens your blood for HTLV antibodies. ELISA tests are either non reactive or reactive. If the ELISA test is reactive then your blood has to be retested with a confirmatory test, a Western Blot or Immuno Blot for example, depending on the laboratory. Your doctor and the laboratory staff know how to do this. The ELISA results have to be rechecked because the ELISA test can give false positive results. 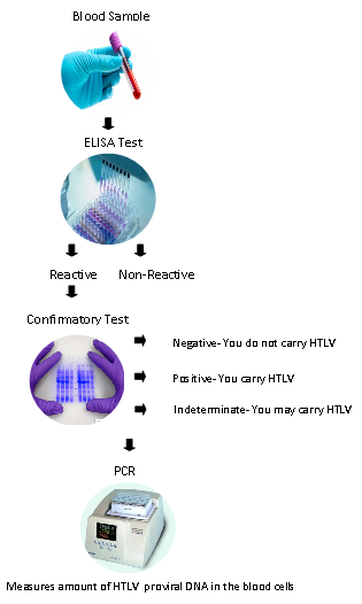 The confirmatory test has two advantages: it can exclude false positive ELISA screens and types the HTLV as 1 or 2. Blood tested with the HTLV confirmatory test can give three test results: the tested blood is either HTLV negative or HTLV positive or HTLV indeterminate. HTLV negative means your body has not encountered HTLV and has therefore not developed HTLV antibodies against HTLV. You do not carry HTLV. HTLV positive means your body has encountered HTLV and has developed HTLV antibodies against HTLV. You carry HTLV. HTLV indeterminate means your body has encountered HTLV and has developed some HTLV antibodies to HTLV. You may carry HTLV. HTLV DNA, which is virus incorporated in the cell DNA, can be detected through PCR testing. PCR stands for polymerase chain reaction. This test looks directly for HTLV proviral DNA in the blood cells. This reports the percentage of peripheral blood mononuclear cells (PBMCs) which carry the virus. So for example if the PCR test says the HTLV proviral load is 1%, then this means that 1 out of 100 PBMCs have one copy of HTLV DNA incorporated into the DNA. The HTLV-1 proviral load fluctuates very little over time and does not gradually rise over time as seen in other retroviral infections. If you require further information ask you general practitioner or contact us directly.